And so today, against all odds, we have a real soap opera scene, and under these circumstances, it’s actually more baffling than anything else. Everything has not been all right. Their brother Carl was killed a week ago, just another in the long series of gruesome murders happening within easy walking distance of the spot where they’re currently standing. And just a few days ago, Edward was standing guard at the Old House with a revolver, waiting for his undead ghoul of a cousin to return to its resting place. I don’t know what could possibly be so interesting in Bangor all of a sudden, but I guess sometimes you just need to get away. And this is a nice break for everyone, because now — for the duration of one scene — we’re in a different show that happens to take place on the same set. Quentin says something about “enjoying the dubious pleasures of the village,” which connects to nothing at all, and then they go into the drawing room to tease Judith for a while. Naturally, Quentin the Discordian trickster thinks this is the funniest thing he’s ever heard. It’s an unexpected surprise that kicks off a whole new generation of family squabbles, and there’s nothing he likes more than when everyone around him is fighting over something he doesn’t care about. But Edward has other views. Judith: Edward, you like Gregory. Edward: As my son’s tutor, yes. Judith: But you admire him, I’ve heard you say so. Edward: That doesn’t mean I want him in the family. Judith: You don’t want anyone in the family! No one I could bring here, at least. You never wanted me to marry. Edward: Frankly, I never thought anyone would have the courage to ask you. Edward: And why, do you suppose? Why? For your money! And Judith hauls off and slaps Edward in the face: WHAM! Hail Eris, all hail Discordia! But there is a serious problem here, even more serious than Edward realizes. After Judith, the money is supposed to pass to Edward’s young son, Jamison — the future of the Collins family name. Now, Judith is giving Trask control, and we’ve already seen how he behaves when there’s money at stake. With no fanfare, just quietly trotting along in the background, this story has set up a nice, juicy threat to Edward, Jamison and the Collins family that we know. Trask marrying Judith and potentially diverting the inheritance away from Jamison is a cataclysmic threat to the entire premise of the show, and nobody’s paid any attention. We’ve already seen an unscrupulous, fortune-hunting husband plotting to murder a Collins child — that’s what Nathan Forbes did, back in 1795. Trask murdered his own wife to get his hands on the money; he’s probably got the nightshade on hand, just waiting for a private moment alone in the pantry with Jamison and Nora’s box of Strawberry Quik. And if Trask succeeds, then the Collins family that we know in the 1960s will never have existed. Plus, Carl’s dead, Quentin and Edward are penniless — there isn’t much hope for any more Collins children. 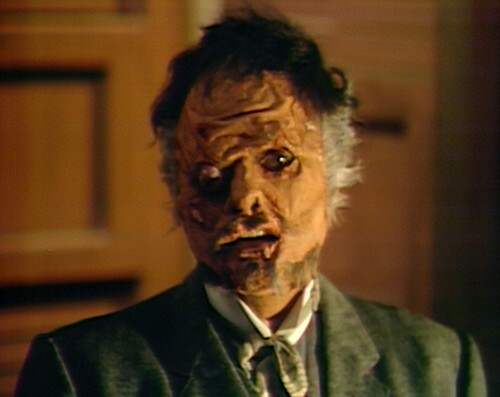 Collinwood will belong, now and forevermore, to the Trasks. As you know, long-term serialized narrative is natural selection for stories — a process that tests out new characters and story ideas, and allows the strongest to thrive. But Dark Shadows, more than any other serial I can think of, is actually a battle for supremacy between different kinds of stories. This is a program where “what is the genre of this television show” is an ongoing, active concern. That question really is important, because our ability to follow the story depends on our understanding of what kind of story we’re watching. If this is a murder mystery, then we need to pay attention to everybody’s motives, and threats of reprisal. If it’s a bedroom farce, then we’re waiting for stuffed shirt Edward to get his hilarious comeuppance. And if this is a nonstop five-alarm Universal Monsters spookshow carnival — and that is exactly what it has become these days — then this scene should not even exist. The only other TV show that I can think of which plays with genre to this extent is Doctor Who, which literally moves the main characters from one planet to another every single episode. Dark Shadows is doing the same kind of Discordian narrative experimentation, and the whole show basically takes place in one house. It doesn’t last, of course, nothing truly beautiful ever does. 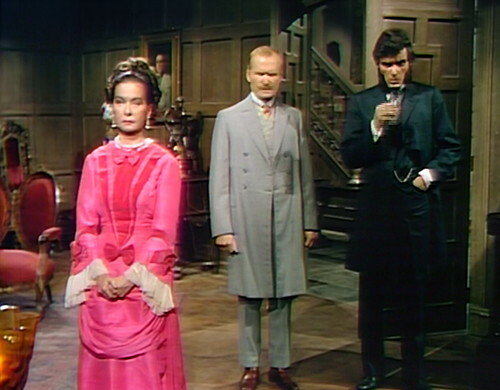 In a couple minutes, Judith will be haunted by the furious ghost of Minerva Trask, which is followed by a noisy argument between a werewolf, a gypsy and the smushed-up remains of a Satanist lawyer. And then Dark Shadows is back to normal, or whatever the equivalent is when you’re so far away from normal that you forget what it looks like. 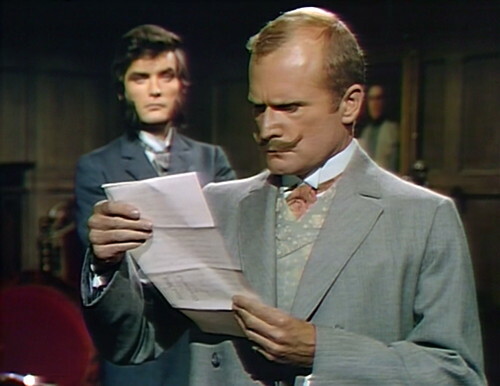 But for a moment, at least, Dark Shadows was a soap opera again, where people have families and relationships and important business words written down on pieces of paper. And as much as I love the nonstop spookshow, it would probably be better for the long-term health of the show to pull back from the chaos a bit, and try to focus on normal human story beats once in a while. If they keep going in this direction, I’d expect them to run out of productive story ideas in — oh, I don’t know, maybe a year and a half from now. And that would be awful, wouldn’t it? Monday: The Blog Post About The Original Music From Dark Shadows with The Robert Cobert Orchestra & Featuring Jonathan (Barnabas) Frid and David (Quentin) Selby. 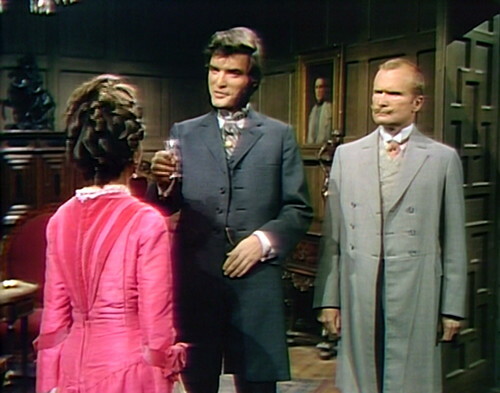 Magda tells Quentin that Barnabas told him to bring the deformed man to the Old House. Quentin asks, “Why did he tell you that?” and Magda waits too long to respond. Quentin follows with, “Huh?” just as Magda starts her line. When Magda leads Evan from the Old House drawing room to the cellar, and Quentin looks at the Petofi box, you can see the top of the set. Edward reminds Judith that Edith’s will guaranteed that he and Quentin would always have a place to live at Collinwood. Actually, when they read the will, Quentin was the only one mentioned. During the end credits, you can see a little patch of green carpet around the tree, and it looks like there’s an extension cord there too. Plus, Carl’s dead, Quentin and Edward are penniless — there isn’t much hope for any more Collins children. Being penniless doesn’t stop people from having children, especially children that could eventually make a claim to a fortune. Plus Quentin already has a child, born in marriage with Jenny. We never see her. She’s just a plot point and that’s all she ever becomes, but she is a Collins an actual legitimate Collins. Who lives long enough to eventually give us Tom, Chris and Amy. I love Joan Bennett in those confrontation scenes – it’s like she’s going back to her 40’s cinema roots and sparring with the likes of Bogie or Tracy. She is fantastic. I don’t understand why poor Carl couldn’t have haunted the family for a few days at least- with practical jokes from the beyond. A pie in the face for Judith, hot foot for Quentin, fake vomit in the foyer. Oh and he could HIDE cousin Barnabas’ coffin! What FUN! For a few days, DARK SHADOWS could’ve been TOPPER. “Before this happened to me, magic… magic was game to me. A form of excitement on long winter evenings. The black arts! Know every world! Not just the one around you. That was my theory. Oh, how I wish I knew the world as everyone else knows it. The normal, everyday world of living and dying!” — a potentially transformative moment for Quentin Collins. 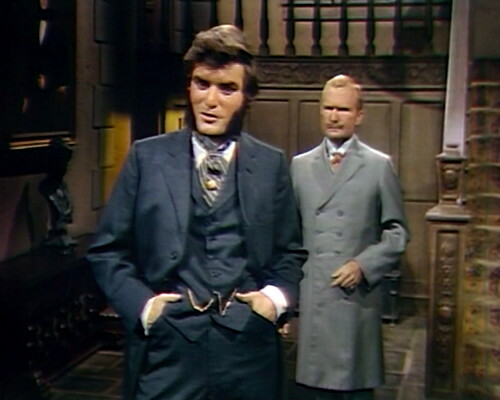 I haven’t seen it in some time, but that’s a great Dark Shadows moment for me. Somehow I always like occult stories where the practitioners are doing it “for the fun of it” as much as any other reason, like Quentin and Evan. And that idea seems to work even better in mainly serious stories like DS than really tongue-in-cheek ones. 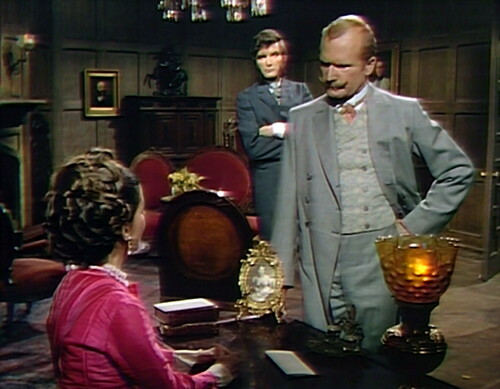 This episode took me back to the pre-Barnabas days, when Joan Bennett and Louis Edmonds shouting at each other was the closest thing we had to entertainment. Interesting that no one seems to be mourning the death of Carl. Always in 1897 when a family member dies everyone else takes to wearing black arm bands round the upper arms of their jackets as a symbol of mourning. But for Carl, nothing. Bright colors instead for Judith. The usual light colors for Edward. No one likes a practical joker. Not in that family anyway. Edward and Judith are really not that bothered by it. They could hardly endure Carl. Their lives have just been made simpler, really. They barely saw Carl as a “legitimate Collins”, because he was a practical joker in a rich, stuffy family, and in 1897, that sort of thing was frowned upon, with the biggest frowns imaginable. It takes two, to frown that big. Edward is deathly embarrassed by embarrassment, and that’s all Carl was to him, a walking debacle, a social catastrophe, and Judith just wishes they would all go to hell. Carl was frivolous, a party boy. He really was not seen as an asset, but a foolish drain on the family bank account. He didn’t bother to make himself of value, so he wasn’t. He failed to get himself taken seriously. He could have been someone they cared about, but he didn’t roll that way. The writing was on the wall, and he ignored it. He decided to be a fool, so he got treated like one. Carl was seen as decadent, incorrigible, and possibly debauched, potentially besmirched. Edward had already threatened to make him “happy all the time”, by sending him “somewhere”. Carl wasn’t upstanding enough. He failed to act like Edward, who has a masters degree in acting like a Collins. It was the super-springy heart-attack-in-a-can Carl gave to Edward that got him killed. It’s not that Edward made plans to kill Carl, he just made plans to be busy somewhere else when it eventually happened. The only person who felt anything was Quentin, and that was mostly guilt. And as much as I love the nonstop spookshow, it would probably be better for the long-term health of the show to pull back from the chaos a bit, and try to focus on normal human story beats once in a while. … Completely agree. I think DS was at its strongest at times when this was happening. Some of my favorite 1897 moments are the battles amongst the four Collins siblings. But one of my beefs with 1897: Just many spooks too often. They lose effect when employed too frequently. I thought that 1897 and 1840 are strong because of moments like this and relationships that are rooted in real emotion (Quentin/Edward/Judith and Quentin/Gabriel/Samantha/Daniel). Concur completely with you both. When the show moves out of 1897 and focuses on the spook of the cycle, much is lost. I once transcribed the “Reading of the Will” scene and used it as an exploration piece for high school students when I was asked to audition for a guest director slot at a local high school. The kids had a blast forming relationships and characterizations and I got the job. the “who is this show for?” conundrum. Yes, the bickering Collins siblings were one of the absolute best parts of the 1897 story. It’s like Oscar Wilde, George Bernard Shaw, and P.G. Wodehouse all got in a s***faced brawl together and somebody wrote it down. Nope. Well, at least partially nope. All custom made, for the specific actors themselves. It’s in the 1840 interviews. You’ve mentioned the apparent age difference between Joan Bennett and Judith before, and I think it becomes especially interesting in this episode. If Judith’s meant to be somewhere in her 30s, or even early 40s, then Edward’s biggest worry would clearly be that she and Trask would have children who could potentially steal Jamison’s inheritance out from under him. However, the idea of a woman Joan Bennett’s age (as opposed to Judith’s) becoming pregnant would probably stretch the audience’s credibility a bit too far, so the issue goes tactfully unmentioned.